Water damage is serious business, folks. Whether it starts with an undetected leaky pipe somewhere and worsens gradually over time, or occurs suddenly, as with a catastrophic flood, water damage is a major cause of property loss, and can also be hazardous to your health. Most water damage occurs in stealth mode, which makes it all the more devastating – by the time you’ve noticed that you have a water intrusion problem, expensive repairs may already be required to fix it. What kind of repairs? It depends on the location. 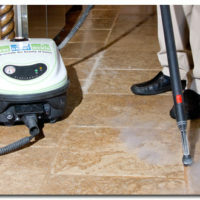 If the affected area is a tiled surface – in your bathroom, kitchen, entryway, basement, etc. — you could find yourself replacing the entire area at great cost and inconvenience, especially if it’s flooring. Deteriorating or missing caulking and grout allows water to seep underneath the tiled surfaces and loosen the tiles over time. Further, the accumulated moisture creates a haven where mold and mildew can thrive, potentially exacerbating respiratory illness and allergies for you and your family. And that’s not all! Insects such as termites would love to chow down on the damp underlying wood. Who would have thought that a little water in the wrong place could threaten the structural integrity of your home? Periodically check these tiled surfaces for evidence of staining and hollow tiles – their presence might indicate that you have a leak somewhere nearby. Tap on each tile with a coin, listening for the characteristic “empty” sound. 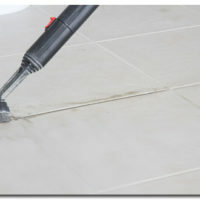 Hollow tiles are loose due to a breakdown in the adhesive material holding them in place. If you find a hollow spot, have it removed and replaced with fresh tile and grout or caulking before the damage can spread. This might seem time-consuming, but it’s well worth the effort when you consider the expense you might save as a result. Determine and repair the source of possible leaks. Don’t ignore anything suspicious. A few drops now can escalate into massive water damage in the future. Consult a professional if you are unable to do it yourself. Consider installing a leak detection system that will alert you to possible leaks, and also make sure every member of your household knows how to shut off the water completely..
Have a look at your appliances around your tiled surfaces, usually in the kitchen or laundry area. Outdated appliances can spell trouble. As appliances age – particularly your dishwasher and washing machine – their plumbing connection hoses can deteriorate and break, possibly resulting in a massive amount of water being released into your home. It’s a good idea to develop a maintenance program. Regularly inspect your appliances for weaknesses resulting from long-term use, and replace any hoses that are between 3 to 5 years old, depending on their condition. Pay special attention to stress points, such as where the hose connects to the water supply. These are vulnerable spots where breakages are likely to occur. Note: If you experience a major leak, protect your tiled surfaces by immediately shutting of your water. Test the shut-valve regularly to make sure it works.